The 100m Twmpau (thirty welsh metre prominences and upward) are the Welsh hills at or above 100m and below 200m in height that have a minimum drop of 30m. 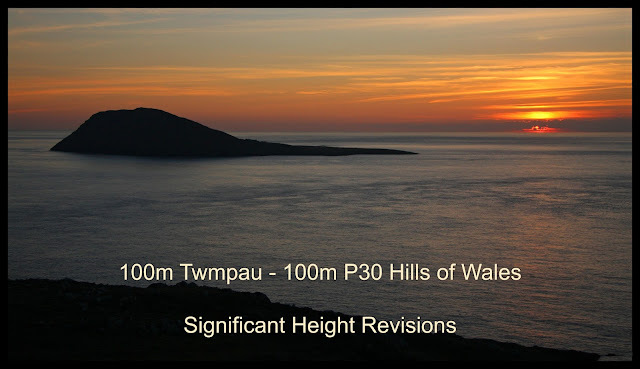 Accompanying the main P30 list is a sub list entitled the 100m Sub-Twmpau with the qualification to this sub category being all Welsh hills at or above 100m and below 200m in height with 20m or more and below 30m of drop. The list is authored by Myrddyn Phillips and the posts that have appeared on Mapping Mountains detailing the significant height revisions to the main P30 list and the sub list appear below presented chronologically in receding order. There has been a Significant Height Revision to a hill that is listed in the 100m Twmpau and Y Trechol – The Dominant Hills of Wales, with the summit height and its location, and the drop of the hill confirmed by LIDAR analysis, and a subsequent summit survey with the Trimble GeoXH 6000, both conducted by Myrddyn Phillips with the latter taking place on the 10th October 2018. 100m Twmpau - Welsh hills at or above 100m and below 200m in height with 30m minimum drop, with an accompanying sub list entitled the 100m Sub-Twmpau with the criteria for this sub category being all Welsh hills at or above 100m and below 200m in height with 20m or more and below 30m of drop, with the word Twmpau being an acronym standing for thirty welsh metre prominences and upward. Y Trechol – The Dominant Hills of Wales – Welsh P30 hills whose prominence equal or exceed half that of their absolute height. 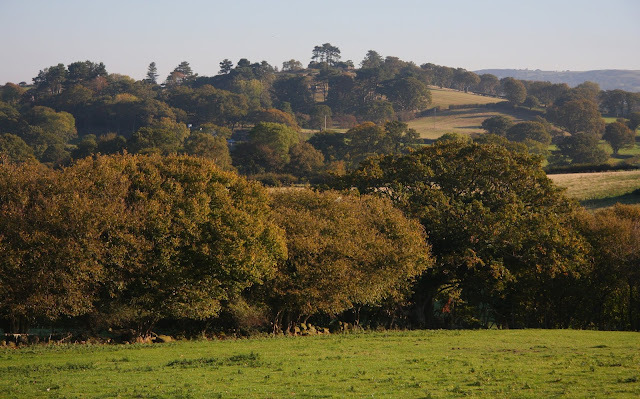 With the criteria for Lesser Dominant status being those additional Welsh P30 hills whose prominence is between one third and half that of their absolute height. The list is authored by Myrddyn Phillips with the Introduction to the start of the Mapping Mountains publication of this list appearing on the 3rd December 2015. The name of the hill is Llys y Gwynt, and it is adjoined to the Carneddau group of hills, which are situated in the north-western part of North Wales (Region A, Sub-Region A1), and is positioned with the B5106 to its west, the B5279 to its south and the Afon Conwy (River Conwy) to its east, and has the town of Conwy to its north. When interpolated heights and drop values were added to the original Welsh 100m P30 list that was published on Geoff Crowder’s v-g.me website, this hill was listed with an estimated c 116m summit height based on interpolation of its uppermost 110m contour ring that appears on the Ordnance Survey 1:50,000 Landranger and 1:25,000 Explorer map. However, it was not until LIDAR became available that the details for this hill could be accurately re-assessed. The LIDAR (Light Detection & Ranging) technique produced highly accurate height data that is now freely available for much of England and Wales. LIDAR analysis for this hill was closely followed by the survey of its summit with the Trimble GeoXH 6000. The term Significant Height Revisions applies to any listed hill whose interpolated height and Ordnance Survey or Harvey map summit spot height has a 2m or more discrepancy when compared to the survey result produced by the Trimble GeoXH 6000 or analysis of data produced via LIDAR, also included are hills whose summit map data is missing an uppermost ring contour when compared to the data produced by the Trimble or by LIDAR analysis. As heights on different scaled Ordnance Survey maps are not consistent the height given on the 1:25,000 Explorer map is being prioritised in favour of the 1:50,000 Landranger map for detailing these revisions. Therefore, this hill’s new listed summit height is 120.6m and this was produced by surveying with the Trimble GeoXH 6000, this is 4.6m higher than its previously listed height of c 116m which was based on interpolation of its uppermost 110m ring contour that appears on the Ordnance Survey 1:50,000 Landranger and 1:25,000 Explorer map, however this new height is in accordance with the 5m contouring on OS Maps. There has been a Significant Height Revision to a hill that is listed in the 100m Twmpau (thirty welsh metre prominences and upward) as well as Y Trechol - The Dominant Hills of Wales, and which was initiated by a survey with the Trimble GeoXH 6000, with these details being retrospective as the survey that resulted in this height revision was conducted on 16th January 2016. 100m Twmpau - These are the Welsh hills at or above 100m and below 200m in height that have a minimum drop of 30m. Y Trechol - The Dominant Hills of Wales - These are the Welsh P30 hills whose prominence equal or exceed half that of their absolute height. With the criteria for Lesser Dominant status being those addition Welsh P30 hills whose prominence is 33% or more and below 50% of their absolute height. The name of the hill is Bryn Maelgwyn and it is situated in the north-western part of the Rhos range of hills that is adjoined to Gogarth (Great Orme), and is positioned above the town of Llandudno. The hill was surveyed in the company of Alex Cameron during a grey and damp day when we visited five P30 Twmpau hills over four separate small walks, with each summit being Trimbled. Bryn Maelgwyn can be accessed from its south where a public footpath enters the Coed y Gell woodland. However, to reach the summit one has to leave this footpath and the going thereafter becomes rougher with brambles and bracken creating a tangled web of undergrowth. When I visited with Alex the underfoot conditions were never difficult and as the deciduous trees are growing relatively far apart from one another there are sufficient gaps in between to make good progress toward the summit. Prior to the survey with the Trimble GeoXH 6000 this hill was listed with c 43m of drop and 40.57% Dominance based on an estimated summit height of of c 106m based on a 105m uppermost contour and 5m contour intervals which appear on the Ordnance Survey enlarged mapping hosted on the Geograph website, and an estimated bwlch height of c 63m, with the summit height produced by the survey with the Trimble being 102.1m (converted to OSGM15). Therefore this hill’s new summit height is 102.1m (converted to OSGM15) which is 3.9m lower than its previously estimated height of c 106m and 2.9m lower than its uppermost ring contour on the Ordnance Survey enlarged mapping hosted on the Geograph website. There has been a Significant Height Revision initiated by a survey with the Trimble GeoXH 6000 to the listing of the 100m Twmpau, with these details being retrospective as the survey that resulted in this height revision was conducted on the 2oth October 2015. 100m Twmpau - These are the Welsh hills at or above 100m and below 200m in height that have a minimum drop of 30m. The word Twmpau is an acronym for thirty welsh metre prominences and upward. The criteria for 100m Sub-Twmpau status are all Welsh hills at or above 100m and below 200m in height with 20m or more and below 30m of drop. The name of the hill is The Pimple; this is a locally known name which was given me when I made enquiries during the survey for the bwlch position of the hill. The hill remains unnamed on Ordnance Survey maps and its locally known name relates directly to the past industrial heritage of the hill, as its summit is made of mining waste that is now stabilised and grassed over. The uppermost part of the summit is relatively small in area and squat in shape, and resembles a pimple as it sits upon another elevated part of the hill. The hill is situated in the eastern part of the Moel y Gamelin range of hills, and is positioned above the small community of Pentre Bychan which is adjacent to the larger community of Rhosllanerchrugog. The hill can be accessed from its west where a public footpath traverses the course of the valley where its bwlch is positioned. However, permission should be sought for those wishing to visit as the summit is not on designated open access land. When I visited I asked permission to do so and was kindly directed to the best ascent route. The term Significant Height Revision applies to any listed hill whose Ordnance Survey summit spot height has a 2m or more discrepancy when compared to the surveyed height produced by the Trimble GeoXH 6000, also included are hills whose summit map data is missing an uppermost ring contour when compared to the data produced by the Trimble. As heights on different scaled Ordnance Survey maps are not consistent the height given on the 1:25,000 map is being prioritised for detailing these revisions. Although this hill’s new summit height of 153.5m (converted to OSGM15) is only 0.5m different from the spot height that appears on the Ordnance Survey 1:25,000 Explorer map, the hill’s summit position has now been established and this is 8.5m higher than the 145m uppermost contour ring shown on the 1:25,000 map for where the summit of the hill is positioned. There has been a Significant Height Revision initiated by a survey with the Trimble GeoXH 6000 to a hill that is now listed in the 100m Twmpau (thirty welsh metre prominences and upward), with these details being retrospective as the survey that resulted in this height revision was conducted on 13th October 2015. With the criteria for 100m Twmpau status being all Welsh hills at or above 100m and below 200m in height that have a minimum 30m of drop. The name of the hill is Bersham Bank; with this being the preferred locally known name for the hill and which was given me when I made enquiries after my ascent (see Significant Name Changes). There is no name for the hill on current maps but ‘Colliery (disused)’ appears on the Ordnance Survey 1:25,000 Explorer map where the hill is situated. As the Ordnance Survey detail implies, this hill is the relic of coal waste which was deposited from the workings of the Bersham Colliery which closed its operations in December 1986. Bersham Bank is situated in the Moel y Gamelin range of hills, and is positioned on the southern outskirts of Rhostyllen, which is a south-western suburb of Wrecsam (Wrexham). There is a circuitous path on the southern and eastern middle section of the hill; this can be accessed from a road to its east that is adjacent to an industrial estate. Beside the road is a perimeter fence seemingly barring entrance to a path on the lower slopes of the hill, however, one section of the six foot high fence has been toppled over giving access to the public, including local people, who I was told occasionally walk up the hill. 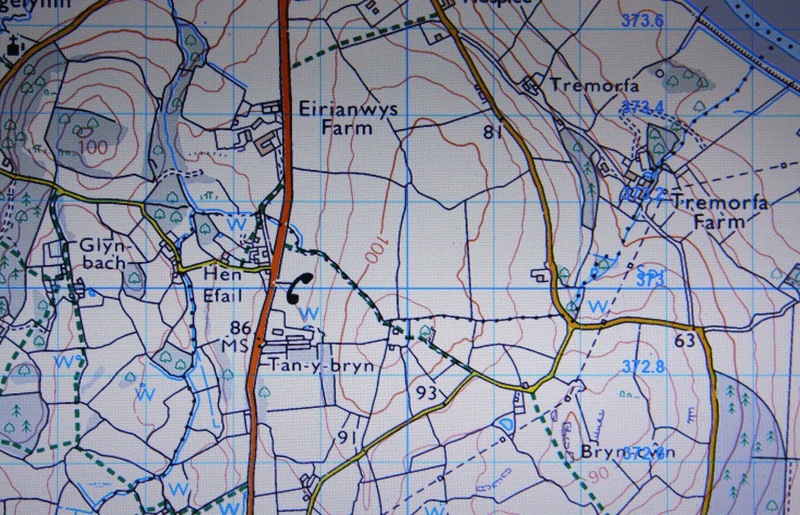 The hill had no classification prior to the survey with the Trimble GeoXH 6000 as although it is prominent and rises almost directly above the A 483; it possesses no contour rings on current Ordnance Survey maps, except for those at its bwlch and these are between 100m – 105m, with the height of the bwlch estimated as being c 103m, with the summit height produced by the survey with the Trimble GeoXH 6000 being 153.6m (converted to OSGM15). Although this hill does not possess any summit contours on Ordnance Survey mapping, there are two hills created from coal waste that are relatively near to Bersham Bank that do possess separate ring contours, these are situated at SJ 311 469 and SJ 300 473. Therefore this hill’s new summit height is 153.6m (converted to OSGM15), as no summit contours exist for the hill this is a dramatic 48.6m increase in height compared to its uppermost hill to hill bwlch contour of 105m. There has been a Significant Height Revision to a hill listed in the 100m Twmpau and Y Trechol - The Dominant Hills of Wales, and which was initiated by a survey with the Trimble GeoXH 6000, with these details being retrospective as the survey that resulted in this height revision was conducted on 8th August 2015. 100m Twmpau - These are the Welsh hills at or above 100m and below 200m in height that have a minimum drop of 30m. The word Twmpau is an acronym for thirty welsh metre prominences and upward. Y Trechol - The Dominant Hills of Wales - These are the Welsh P30 hills whose prominence equal or exceed half that of their absolute height. The name of the hill is Bryn Mawr and it is situated in the lower hills of the Carnedd Wen range, and is positioned above the small community of Four Crosses which is situated beside the Afon Efyrnwy (River Vyrnwy) and part of the Montgomeryshire Canal. The hill was surveyed in the company of Alex Cameron during a multi hill bagging day when the weather was set fine and we visited nine P30 Twmpau hills with seven of them being Trimbled. Access to Bryn Mawr is good from the west of its summit, as there is sufficient parking close to a gate that accesses a field to another gate which leads on to the hill. However, the upper section is overgrown and the ancient earthen embankments of its hill fort are now immersed in long grass, nettles and brambles. The summit is easily identified and the hill is recommended as there is a peaceful ambiance to it. The hill has a 170m uppermost contour ring on Ordnance Survey 1:50,000 Landranger and 1:25,000 Explorer maps, with the latter having contour intervals at 5m. 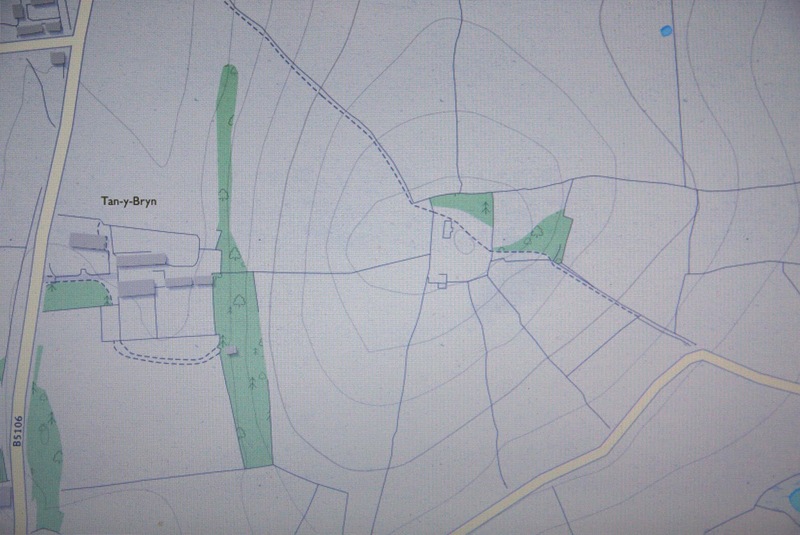 Prior to the survey with the Trimble GeoXH 6000 the hill had been listed with an estimated summit height of c 174m based on the dimensions of the uppermost contour in relation to the steepness of the surrounding ground, with the height resulting from the survey with the Trimble GeoXH 6000 being 178.1m (converted to OSGM15). Therefore this hill’s new summit height is 178.1m (converted to OSGM15) which is 4.1m higher than its previously estimated height of c 174m and 8.1m higher than its uppermost ring contour on Ordnance Survey 1:50,000 Landranger and 1:25,000 Explorer maps. There has been a Significant Height Revision initiated by a survey with the Trimble GeoXH 6000 to a hill that is listed in the 100m Twmpau (thirty welsh metre prominences and upward), with these details being retrospective as the survey that resulted in this height revision was conducted on 8th August 2015. With the criteria for 100m Twmpau status being all Welsh hills at or above 100m and below 200m in height that have a minimum 30m of drop. The name of the hill is Y Gaer and it is situated in the Carnedd Wen range, and is positioned above the small community of Trefnanney which is beside the Afon Efyrnwy (River Vyrnwy) and the Dyffryn Meifod. Y Gaer was surveyed in the company of Alex Cameron during a multi hill bagging day when we had glorious weather and visited nine P30 Twmpau hills with seven of them being Trimbled. The hill has two uppermost 125m ring contours on Ordnance Survey 1:25,000 Explorer maps, these are bisected by a lane that follows this hill’s summit ridge in a south-west to north-east direction. It is from the top of this narrow lane that easy access to the high point of the hill can be found. 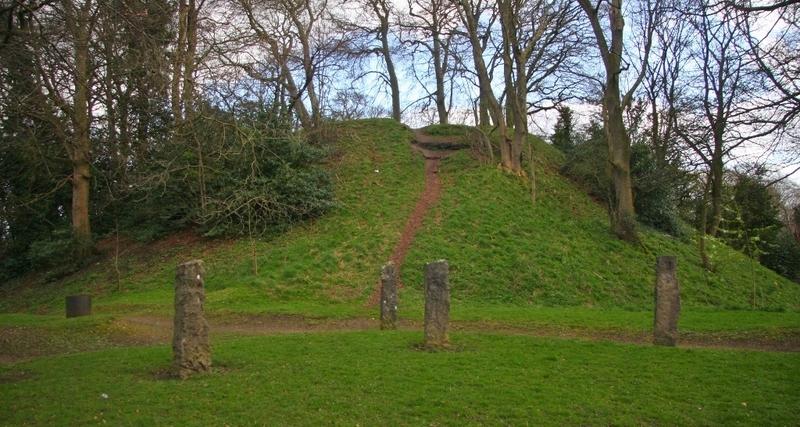 The larger of the two uppermost ring contours is positioned to the west of the smaller one, and it is the larger ring contour where the remains of an ancient earthen embankment is indicated on Ordnance Survey maps. It is this ancient hill fort that gives the hill its name. 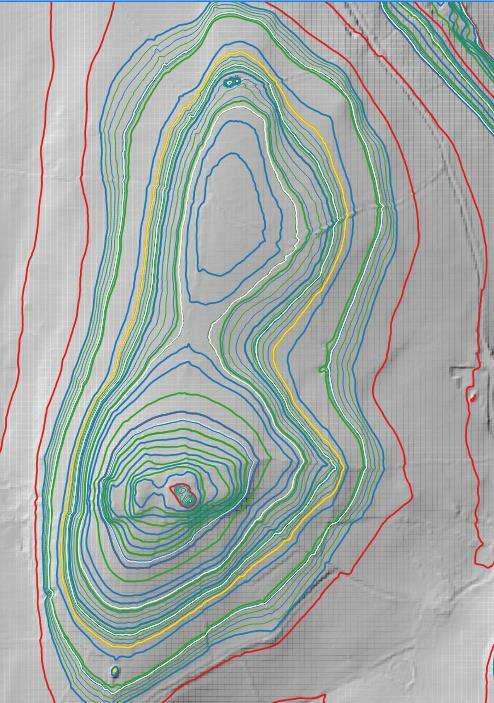 Prior to the survey with the Trimble GeoXH 6000 the height of the hill was estimated as being c 129m based on the dimension of the uppermost westerly 125m contour ring against the steepness of ground as indicated by contours on this hill’s northern, western and southern slopes. However, the summit of this hill now possesses a covered reservoir which is indicated as a small round circle on Ordnance Survey maps, and as a number of P30s comprising many walks took place on the day of this hill's survey the lay of land was quickly judged and the Trimble GeoXH 6000 placed on land that probably forma a part of the covered reservoir. If the hill is visited again the land will be re-assessed, but until then the height and position of the summit is being taken as that produced by the Trimble, a second visit would also give chance to survey the highest point of the easterly contour. The term Significant Height Revision applies to any listed hill whose Ordnance Survey summit spot height has a 2m or more discrepancy when compared to the height surveyed with the Trimble GeoXH 6000, also included are hills whose summit map data is missing an uppermost ring contour when compared to the data produced by the Trimble. As heights on different scaled Ordnance Survey maps are not consistent the height given on the 1:25,000 map is being prioritised for detailing these revisions. Therefore this hill’s new summit height is 130.5m (converted to OSGM15) which is 1.5m higher than its previously estimated height and 5.5m higher than its uppermost ring contour on current Ordnance Survey 1:25,000 Explorer maps. There has been a Significant Height Revision initiated by a survey with the Trimble GeoXH 6000 to the listing of the 100m Twmpau (thirty welsh metre prominences and upward), with these details being retrospective as the survey that resulted in this height revision was conducted on 8th April 2014. With the criteria for 100m Twmpau status being all Welsh hills at or above 100m and below 200m in height that have a minimum 30m of drop. The name of the hill is Bryn y Beili (Bailey Hill in English) and it is situated in the Bryniau Clwyd range of hills and is positioned in the town centre of Yr Wyddgrug (Mold), which is situated in north-east Wales. The survey was conducted in the company of Mark Trengove over two days, three weeks apart, and it was Mark who proposed that this hill was a candidate for becoming a new P30, his inclination proved correct. With the first survey concentrating on the bwlch and which resulted in an unfortunate incident when the Trimble wrestled with a car and was run over, whilst the second survey concentrated on the summit of the hill. The hill can be accessed from the top of the High Street in Yr Wyddgrug (Mold), although the hill is prominent within the town it is almost hidden from view as it rises behind the former Pendref Chapel and is surrounded by a high wall, trees and shrubs. The summit height of Bryn y Beili has been increased from its current Ordnance Survey map height, as prior to the survey with the Trimble GeoXH 6000 the hill was not listed as it only had an uppermost ring contour of 130m on Ordnance Survey 1:25,000 Explorer maps, with a 135m spot height appearing on lower ground in the centre of a bowling rink on the Ordnance Survey enlarged mapping hosted on the Geograph website. The hill's new summit height is 143.0m (converted to OSGM15) which is 8.0m higher than the 135m spot height.